Home > Fiction	> MFTS – Hedge Attack! Here is my contribution to Mondays Finish the Story, hosted by Barbara Beacham. This week it is using my opening line! We get around 150 words to finish the story based on an opening sentence (in bold in my story) and a photo. The barista shook his head. That hedge couldn’t have moved closer overnight. Could it? The next day it was half-way to the door. The barista rubbed his eyes but said nothing, fearing that the madness that had inflicted his late grandfather was taking hold. Two days later, they were in the shop! Now everybody noticed. The barista’s relief that his sanity was intact was short-lived, however, as the hedge slithered towards him. “Wha… what do you want?” he screeched, trembling. “How rude!” said one of the hedge-people. “Whatever happened to ‘Good morning, may I take your order’?” muttered another. “Cappuccinos all round!” said a third. The barista breathed a sigh of relief. “And one more thing…” (the barista’s heart thumped in his chest) “… a plate of blueberry muffins!” The barista smiled and filled their order. All that worry and panic over nothing. At their table, the hedge-people were talking. Must have cappuccinos first, then kill the humans. Those hedge-people have their priorities straight!! Great story!!! Haha! Instead of eat and run, they eat and kill. Great story Ali! Thanks for the prompt sentence this week. First things first. Those muffins looked too good to miss out on! Yes, it is too bad they weren’t good enough to want to keep them alive so they can make them some more. 🙂 Great story! You just can’t relax for minute. You have to watch everything all the time. Geez. 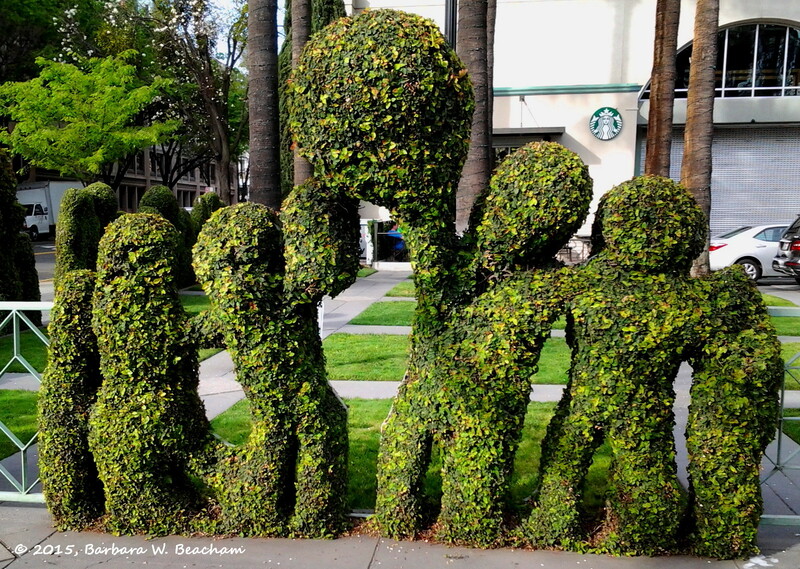 You certainly can’t trust human-shaped hedges. My goodness but that was a whole lot of niceness leading to destruction….militant hedge people….enjoyed your take…. It doesn’t hurt to be polite before the violence! It took them, what, four days just to get inside the shop? I like the barista’s chances of outrunning these hedge people. That was them in “sneak mode”. I bet they can really move when their sap’s up! Rather than write my OWN Mondays Finish the Story this week, I’m-a-gunna reblog this fabulous little tidbit from Dramlian on Life. Laughing is good for you people! Had to reblog this ’cause it was too darn funny. And much easier than trying to come up with my own MFTS this week. 🙂 Thanks for the great bit of Flash. Haha, omg, revenge of the hedges! This gave me such a laugh! Nice dialog. Truly fun! Hedge revenge, but only after coffee and muffins! They have their priorities straight! Good one, and congrats on a great photo and prompt! Maybe one of the customers is a landscape gardener. Though he’ll probably be the first victim! Starbucks bouncers aren’t what they once were, sadly. It’s war of the Hedgerows. You tricked us into expecting a “happy ending” ….Good surprise at the end there. Also the descriptions of the barista’s various stages of feeling set the tone of the story excellently. I’m glad you enjoyed it, and the barista’s constantly changing state of mind! Love the twist at the end! Great story, Ali! I’m a real one for twists! I’m glad you liked it.